November, is a significant month for the communists of Turkey. November 6th of 1917, is the day when the fire of the Great October Revolution had been set off. November 1986 is the month when the Marxist theoretical journal Gelenek had been first launched. November 1992 is the time when the Party of Socialist Turkey (STP) had been founded and November 2001 is the historical moment when the name TKP (Communist Party of Turkey) was reclaimed by the Socialist Power Party (SİP). Communist Party, Turkey (KP) held regional meetings on the day of those anniversaries all around Turkey this year. The meetings were held in İstanbul, Ankara, İzmir, Adana, Antalya, Bursa, Çanakkale, Diyarbakır, Eskişehir, Kocaeli and Samsun. Meetings started with the International Anthem and proceeded with a video show on the occasion. 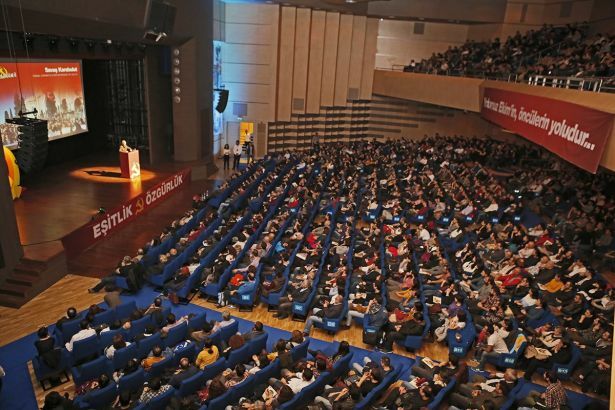 KP leaders addressed the meetings, stating the recent political developments and conditions in Turkey besides indicating the activities and strategies of struggle of KP within the working class and other popular strata. Another agenda of the meetings were the process for the return of TKP into the active political arena. All the meetings demonstrated the enthusiasm, hope and dedication of the communists on the struggle of the working class in Turkey. "Long live the Communist Party of Turkey!"